OSD- Passed Graduation and 10 year Post Qualification Experience. Administrative Officer- Passed PG Degree/Diploma in Personal Management/Public Administration and 7 Year Post Qualification Experience. Junior Engineer- Passed Degree/Diploma in Civil/Electrical Engineering and 3-5 Year post Qualification Experience. Office Assistant- Passed Graduation and 5 year Post Qualification Experience. System Assistant- Passed Degree/Diploma in CS/IT/Electronics and 3 Year Post Qualification Experience. Conference Manager/Programme Manager- Passed UG/PG Degree and 2-4 year Post Qualification Experience. Eligible Candidates can Submit IIM Rohtak Non Teaching Staff 2019 Online Application Latest by 13th April 2019. 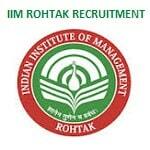 Applicants First Open IIM Rohtak Official Website. Click on Call for Administrative Positions. Applicants Now Download Application Format of Applicable Post. Print and Fill Up Application Format. Scan Required Documents and Application Form. Mention "Position Name................ IIM-R" in Subject of email. Now Candidates May Send their Application to the Email Address- careers@iimrohtak.ac.in. Applicants Should email their Application Latest by 13th April 2019.